Paper collage with beeswax, acrylic paint in various colours, goldleaf, diamonds held with super-glue, silverpoint on prepared silver point paper, a metal rod supporting a drawing in blue and black ink on thin paper over aluminium foil covered by glass, foam board and graphite. Double sided working drawing on heavy-weight paper. Rectangular cut into the shape of a curved topped archway, with two additional wings top right and top left, stuck on with glue. These wings each have pin-pricks which form the characteristic star constellation of Ursa Major, the ‘Great Bear’; in Britain often called ‘the Plough’ and in North America, ‘the Big Dipper’. This echoes the same constellation found on the dark circle covered with glass on the reverse. The edge of the drawing has been singed/burnt. Running along the length of the bottom are touches of beeswax, which are visible on both sides; on the front the wax is laid over a white acrylic ground which is partly visible. Inscribed in silverpoint ‘Every man and every woman is a [star]’ [pictogram of a ‘star’], on a torn fragment of specially prepared silverpoint paper bought by the artist in Paris. There is a touch of gold leaf to the left of the inscription. The dot above the letter ‘i’ of the word ‘is’ is a red diamond, stuck on with super-glue. The pictogram ‘star’ in the inscription is a pentangle - a star with 5 points, formed by 5 straight lines enclosing a pentagon. The five points of the pentangle are painted in acrylic in 5 colours; red, green, blue, black, white, and in the central pentagon there is a spot of black. The ground of the silver point paper has been cut away under this star so as to sharpen the edges of the five points. 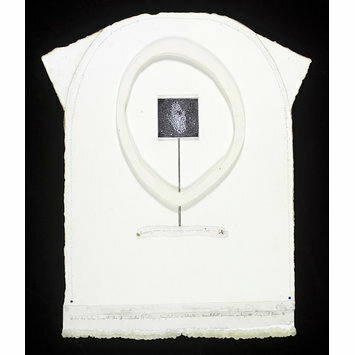 The silverpoint tool used to write the inscription forms the rod supporting the portrait of Francis Bacon; the rod was traced round and its shape cut out of the paper so that the rod is inserted into the space and is visible on both sides. The portrait of Francis Bacon is painted using dark blue ink [which appears black] on thin paper laid over aluminium foil. The portrait is scratched through the ink, and sometimes through the paper so the likeness of Bacon is created with black ink, the white of the paper and the silver of the foil; aluminium foil was used instead of silver leaf, as silver would eventually tarnish black. The whole is covered with a piece of glass. The inscription running around the archway reads ‘Every man and every woman is a [star] [pictogram of a star]’, repeated 7 times, with an increasing number of dots running between the phrases, linking them in one continuous inscription. The inscription begins with a dot of black ink and ends with a dot of dark blue ink. The inscription running along the bottom reads: ‘Under the lashes beneath the lid a cluster of images glimpted [glimpsed] in a blink… Beautiful dreamer perhaps [eye] [pictogram of an eye] sleep and dream U’. Inscription running underneath the edge of the wax strip at the bottom: ‘Working drawing for Every Man and every woman is a [star] [pictogram of a star] 2008/2013 Michael Clark’. Inscribed in reverse mirror writing in silverpoint, ‘Every man and every woman is a [star]’ [pictograph of a star], on a torn fragment of specially prepared silverpoint paper bought in Paris by the artist. There is a touch of gold leaf to the right of the inscription. The dot above the letter ‘i’ of the word ‘is’ is a red diamond, stuck on with super-glue. The pictogram ‘star’ in the inscription is a pentangle - a star with 5 points, formed by 5 straight lines enclosing a pentagon. The five points of the pentangle are painted in acrylic in 5 colours; red, white, black, blue, green, and in the central pentagon there is a spot of black. The silverpoint tool used to write the inscription forms the rod supporting a dark circle covered with glass. The rod was traced round and its shape cut out of the paper so that the rod is inserted into the space and is visible on both sides. The circle is painted in dark blue ink [which appears black] on thin paper laid on aluminium foil. The star constellation of Ursa Major, the ‘Great Bear’ is scratched out of both the ink and paper so that the foil glints through; aluminium foil was used instead of silver leaf, as silver would eventually tarnish black. The circle is covered with a piece of glass. 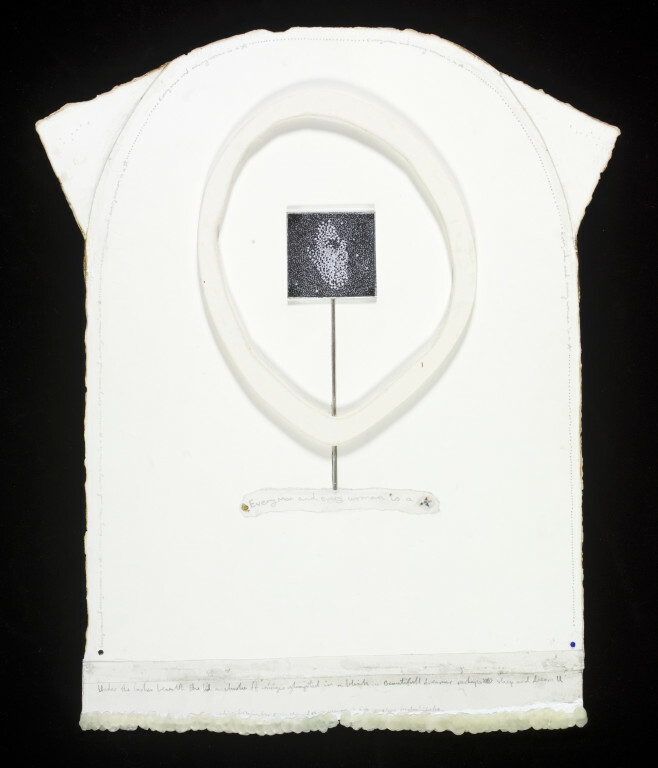 The dark circle and the supporting rod are surrounded by an irregular oval made of thick paper laid onto foam board. The inscription running around the archway is in graphite and reads: ‘MIRROR’, repeated all the way round the archway, sometimes in reverse mirror writing. The inscription begins with a black dot of ink and ends with a blue dot of ink. The inscription running along the bottom, partly obscured by strip of wax: ‘The great bear wept to the night [? obscured by the wax] fell from the sky’.